Classic coconut cream pie served in a coconut oil based crust. To make the pie crust, in a large mixing bowl, whisk together 1 cup flour, 1 tablespoon sugar, and salt. Work the 6 tablespoons butter and shortening in, using a pastry blender or your fingertips, until the mixture resembles pea-sized lumps. Sprinkle in the water, 1 tablespoon at a time, stirring gently with a fork after each addition and adding only enough of the water to form a rough mass. Roll out the pie dough, thinly, on a floured surface, and fit into a 9-inch pie plate; trim and flute the dough edges. Place a large square of foil over unbaked pie crust and press gently over the bottom and sides. Fill the shell with dried beans or set pie weights in center. Bake for 18-20 minutes, or until the edges just begin to brown. Remove from oven and carefully lift out the foil and weights. Prick the bottom of the pastry evenly with a fork, return to the oven and bake for 6-8 minutes, or until golden brown and cooked through; cool on a wire rack completely before filling. Reduce oven temperature to 350 degrees F.
To make the filling, whisk together egg yolks and cream of coconut, in a large mixing bowl, until well combined. Whisk together milk and 5 tablespoons flour, in a large saucepan, set over medium heat. Bring mixture to a simmer, whisking frequently, until hot. Gradually whisk milk into egg mixture, until well combined. Add liquid back into saucepan, and bring mixture to a boil, whisking constantly. Continue to boil for 2 minutes, or until thickened. Remove pan from heat, whisk in 1 1/4 cups ground coconut, 2 tablespoons butter, rum, and vanilla, until well combined. Pour the filling into the baked pie crust, and cool for 20 minutes at room temperature. Cover with waxed paper, and place in refrigerator to chill for 3 hours, or until ready to serve. To make the toasted coconut topping, toss 3/4 cup coconut and 1 teaspoon sugar together on a small sheet pan. Bake at 350 degrees F, for 3-4 minutes, or until golden brown; set aside to cool. When pie has chilled, prepare whipped cream topping. In a large mixing bowl, using an electric mixer on high speed, beat together heavy cream and 3 tablespoons sugar, for 2 minutes, or until stiff peaks form. Spread whipped cream evenly over chilled pie. 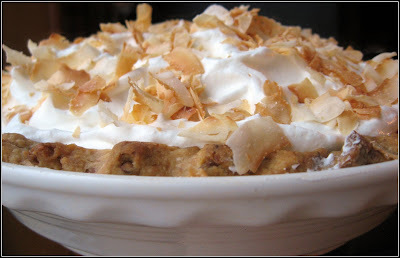 Top whipped cream with toasted coconut. 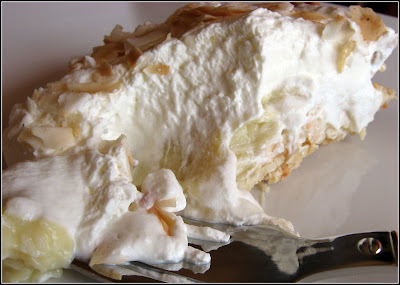 46 comments on "I Spy a Coconut Cream Pie"
I'm looking forward to the round up! I'm a true lover of coconut and have yet to try a coconut pie. You've convinced me on this entry that I must add this to my long list of recipes to eventually try! Coconut cream pie is my all-time favorite pie. I don't think I've ever seen one quite so grand. That is a beauty. What a talent! I have never heard of using coconut oil in food. That sounds interesting, Emiline! And that pie is just luscious! We love coconut here in Brazil. Ooooh, one of my all time favorites! That looks amazing! Coconut pie is not usually my fave but you made it sound/look especially appetizing!! I love that cream of coconut stuff. One of my earliest and fondest memories of dining as a kid was eating coconut pie for dessert. Thanks for the memory lane trip! 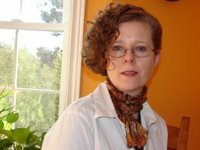 I am such a huge coconut fan and love to see other blogging buddies do it proud. This pie looks and sounds incredible!! I'd love a slice right now!! Mmmm! Hi Em - I use to have that book on my wish list. I like the pie's title. this looks like a very, obscenely good pie. like i pie that i want to be eating. i don't know if i'm going to have time to participate in the pub crawl, but i'm sure as heck gonna try! WOW. That looks so good! I want some! Looks gorge as always, Em. I don't think I'd be able to decide which kind of pie I like best. But this one sounds amazing! I've been wanting to try coconut oil since I saw it on Jenny's blog - I need to look for some! Yum! 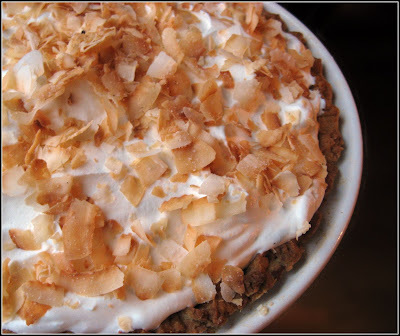 I love homemande "coconut cream pie" and this would be lovely dessert for Easter Sunday. Thanks for sharing. I've never had the pleasure of having Coconut Pie and your pie looks so delicious! That Coconut Cream pie looks amazing! I bet it's better then any store bought cream pie. Wow! You had me licking the screen! That looks so delicious Emiline. i am working hard on getting my entry in to you by the deadline! You would win the heart on mon mari with that pie... He loves coconut cream - and I don't do pies! I saw this pie and thought that I had died and gone to heaven. Make mine a double helping please. Coconut oil is supposed to have health benefits. I've been seeing around but have yet to purchase. I always have just used it for cosmetic reasons. I like your version of this pie. This is really appealing. That coconut cream pie looks good! I have never had one. Bookmarked to try. I am really going to have to look for some of that coconut oil as well. I love coconut cream pie but I am the only one in the house who does (more for me!!). Looks wonderful! The week has been so chaotic that I am afraid I miss your Pub Crawl event. Could get internet connection until tonight anyway. I am sure it will be a success though! That looked absolutely gorgeous. That's funny that you said you're tired from making the pie and typing up the recipe. I don't know why, it just sounded funny. But where was the Cool Huip? Even though I haven't tasted it, I would agree that this is the best coconut pie ever! Those thick curls of coconut on top are making me salivate, and it's only 5:57 am here! Hmmmm cocomut pie! It looks delicious because I like anything with coconut in it. I have never heard of cream of coconut - now I'm on a mission to find it. Would you believe that I have never tried Coconut Cream Pie? I have spent a substantial part of my life thinking that I didn't like pie (?!). Now that I have learned the error of my ways, I think I have some catching up to do...I wish I could start with this one! My husband does not like coconut so I can't make this because I would eat the whole thing myself...wait...maybe I'll make this after all! Wow! I would love to taste it. Looks so delicious. Emiline, that pie is just gorgeous! Stunning, really. I'm jealous of your baking abilities -- when it comes to baking I'm a total hack! I'm so disapointed that I never got around to making something for your blog event--next time hopefully. Can't wait to see the round-up. How come there's no sugar in the filling? The cream of coconut is sweetened already. Look for a brand such as Coco Lopez. Don't buy unsweetened coconut milk - that's not the same thing. This looks like a fabulous pie, and I will make it today for a friends birthday. The filling ingredients and proportions are very good, but I am concerned about the coconut cream being pre-sweetened advice. I shop asian markets where the coconut cream is not sweetened, so I wonder if you have a suggestion for how much sugar to add? Thanks! Scott, I'm worried about trying it with unsweetened coconut milk. Coconut cream is a lot stiffer than coconut milk. You're going to have a runny pie if you use coconut milk. If you want to try it, I'm guessing you would used 3/4 cup coconut milk, 6 tablespoons (or 1/3 cup) flour, and maybe 1/2-2/3 cup sugar. Thanks! It worked out just fine to add a heavy 1/2 cup sugar to the regular UHT unsweetened coconut cream available at the asian market, I did not intend to use coconut milk at all. I also substituted maple liqueur for malibu rum, will also try mango next time. Great recipe, thanks for the ideas!